In the light of the recent and considerable improvement of Rwanda’s perceived level of corruption as being one of the least corrupt countries in Africa, it is interesting to see how our National Chapter in the country is contributing to this positive change. This article presents a grassroots approach which focuses on empowering citizens and putting pressure on policy makers at the local level. Often, victims of corruption find it difficult to step forward and report, particularly citizens in countries where infrastructure, public transport or uneasy internet access means they have to travel far from their home towns to make a report. Transparency International’s Legal Advice Centres are trying to bridge this gap by creating district and mobile centres to support citizens in rural areas and remote regions to make people aware of their rights and step forward to complain about corruption. District centres offer citizens a more accessible and confidential access to support, legal advice and follow-up on the corruption issues that affect their communities, with a supportive staff and in a trustworthy environment. This approach has gained considerable foothold in East Africa and more particularly in Rwanda where the National Chapter has now opened a fifth district centre. We contacted the National Programme Coordinator for the centres, Ms. Francine Umurungi, to ask her a few questions on this interesting approach to curbing corruption at the local level. Q. Why did you decide to expand with district offices? Though Rwanda is small, having one centre in Kigali would not make it easy for everybody who needs legal advice and support to access the main office. And although citizens from far were given the opportunity to reach the main office using the toll free line, Transparency Rwanda (TR) is paying for the phone services which may be expensive if we need to hear the whole story of the client about his/her complaint and in most of the cases we end up asking them for a meeting at the office. “We used to have people from remote regions visit our centre in Kigali, but often they were asked to come back the next day with the supporting documents, and this would often be enough to stop citizens from coming back”. Nowadays our regional Advocacy and Legal Advice Centres are able to take care of this in a much more efficient way”. Face to face meetings are important to understand the whole picture better. Many people cannot come to Kigali. A bus ticket is sometimes expensive to some of our clients. Little research on this has been done before but it was easy to tell that people would come to an office if it was closer. Being closer would allow TR to better understand and reach more people. We decided to go to each corner. Q. Is the centre only for people who wish to complain about corruption? The centres welcome everybody and then at a later stage the corruption issue is identified. In the district centre of Musanze numerous contacts are mainly related to property rights or court decisions or service delivery. Bribes implicated are rarely proven. Corruption here is not easily identifiable. This is why we have chosen to help everybody. Other centres do not have as many contacts but they still have 3-4 contacts/visits per day. 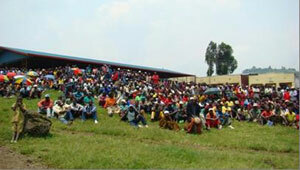 Rwanda: A crowd is gathered to watch the community outreach event of the regional ALAC centre. The other benefit with the regional presence is when we do our outreach activities. Now it is easier since we have people on the ground and that we have signed MOUs (Memorandum of Understanding) with local leaders, at a district level. When we want to highlight an issue, we are invited to act locally; we are informed by local leaders thanks to the MOUs and our staff on the ground can attend without travelling far. And to mobilise people, the district centres know the municipality calendars which makes the organising of community events much easier. Q. What are the typical issues and concerns people bring to the attention of your centres? An example of a recurrent issue that we encounter quite often at a local level: the Implementation of the Court Resolutions. Government officials at decentralised levels are in charge of effecting the court judgements but in most cases they fail to comply with the time limits provided for by the law because of different reasons including not only corruption but also some loopholes in the law and procedures. This is becoming an important issue in the community and TR decided to advocate for the rights of the victims. Now that we have a local presence we can be much more efficient in our assistance to the citizen and at the same time put pressure on local institutions to reform and improve their administrative processes. This will reduce the amount of corrupt practices and help to improve the systems. Q. What makes your regional centres so capable of helping people? It is related to many different aspects. Our staff is professional. The centres are near not only to citizens but also to the leaders, which makes any actions/decisions easier. But most importantly, there is also a high political will to solve citizens’ complaints at higher levels. 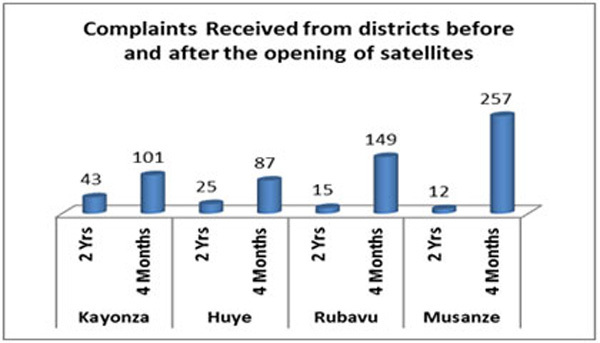 Though it is not easy to measure the success of the centres now because they are still new, it is at least clear that the number of clients received in the districts where our centres are opened has increased tremendously. And it is also obvious that the number of citizens who got help from our centre has increased proportionately. To assess our progress we generally meet with local partners after 6 months of operations and we do a report on the lessons learnt. It is an informative meeting which allows our district partners to be informed of the issues in place and find possible solutions together. But most importantly, in these meetings, institutions which are concerned with the issues raised, take decisions to solve the problems. Today, the success of the pioneering regional expansion in Rwanda is being replicated in many of Transparency International National Chapters in the Africa and Middle East region: TI Kenya operates three centres and in Senegal and Zimbabwe the Chapters are running Mobile legal aid clinics in urban and rural districts. In Morocco the Chapter launched its first regional antenna in the city of Fez and in Lebanon the Chapter in Beirut is currently fundraising to open 2 regional centres. Most impressive is the West Bank Chapter in Palestine which has managed to open a satellite office in the Gaza strip in spite of the difficult context of the region. Overall, and with more than 25 centres in 17 countries, the TI National Chapters in the Africa and Middle East region have been very quick to see the added value of decentralising their activities and making sure that the services and support of TI is as close to citizens as possible. It is clear that Transparency Rwanda is setting the trend for the years to come. 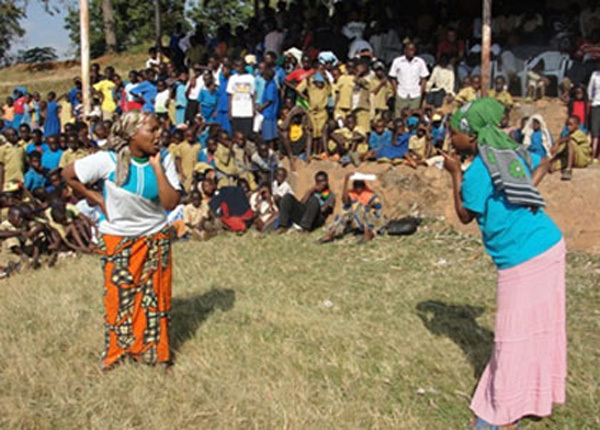 Rwanda: A theatre play which aims to raise awareness of citizens on corruption issues in daily life. 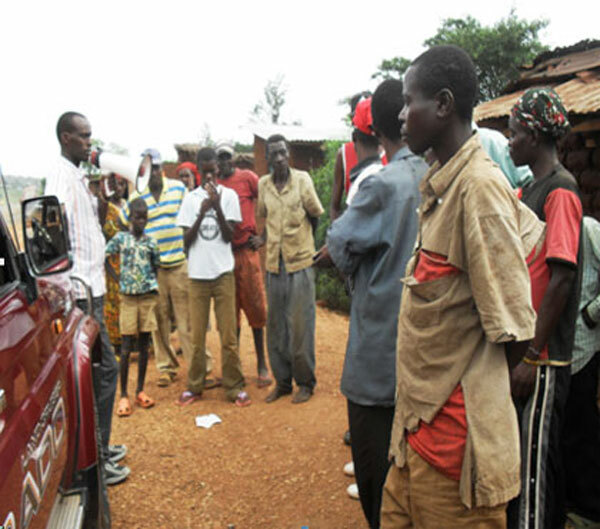 Our colleagues in Burundi are informing citizens of Cibitoke of the time and place of the mobile outreach and legal aid clinic.